Johannesburg - On the back of a successful 2017/2018 Dakar race and multiple championships in the local cross country race series, Toyota Gazoo Racing South Africa announced the teams that would be representing Toyota South Africa’s Motorsport effort in the off-road racing series for 2018. Speaking from the Hallspeed Racing development facility in Midrand, team principal Glynn Hall congratulated the team for the 2017 seasons success and went on to outline their plans for 2018, including the new teams that would be campaigning vehicles in the coming rally- and cross country series. First up was the team of driver, Giniel de Villiers and navigator, Rob Howie, followed by young Henk Lategan and, navigator Dennis Murphy. The third team announced were the Horn brothers of Malalane Toyota, and finally, the rally team driver, Guy Botterill, and his navigator, Simon Vacy-Lyle, who continue to fly the Toyota flag for the 2018 season. The teams will be campaigning the Dakar spec Hilux in Class FIA with the Horn brothers representing in Class T, and Botterill and Vacy-Lyle continuing their championship chase in the Toyota Etios Class R2 rally car. In addition to competing in the local SACCS (South African Cross Country Series), Toyota Gazoo Racing SA will also be taking part in a number of international races, as part of its preparation for Dakar 2019. The details will be announced in due course. Said Glyn Hall, "While we were extremely satisfied with our performance on the Dakar Rally, there are always gains to be made, and we certainly won't be resting on our laurels this year." 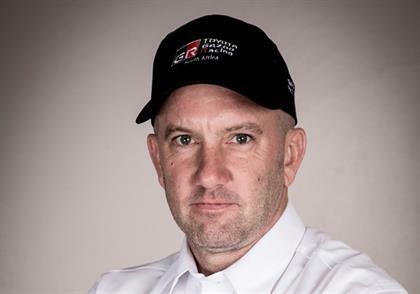 "For us at Toyota SA Motors, motorsport has always been an integral part of both our DNA and our marketing strategy. As such we are looking forward to the 2018 season, both locally and internationally, and we are confident that our products will continue to perform at the very highest levels," said Glenn Crompton, Toyota SA Marketing Vice-President. With plenty of experience and raw talent combined in the cockpits, the 2018 season is looking bright at Toyota Gazoo Racing SA.